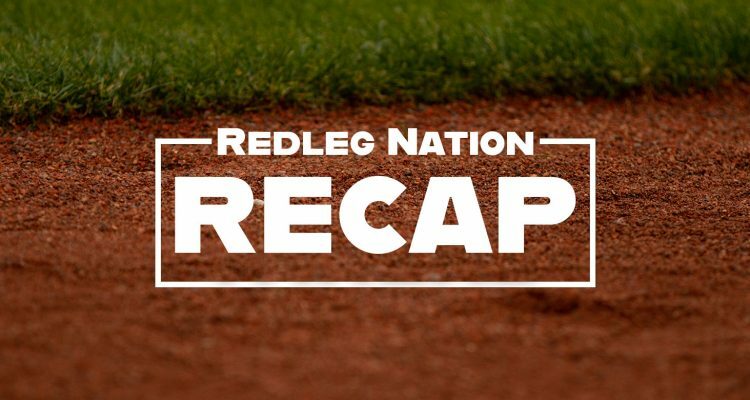 Anthony DeSclafani got hit hard for a second straight start, and the Reds found themselves trailing 4-0 after the first inning. The Reds tied the game up in the fifth inning on a Jesse Winker three-run blast. 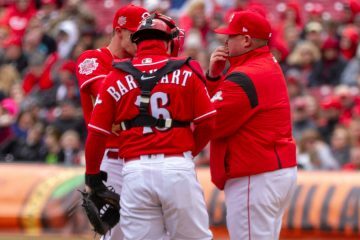 However, the Reds bullpen couldn’t get it done today as Garrett and Hughes each gave up homers and Duke walked in a run. According to Fangraphs WPA statistic (winning percentage added), the most important play of the game was Jesse Winker’s 3-run home run with 1 out in the 5th inning, tying the game at 4. 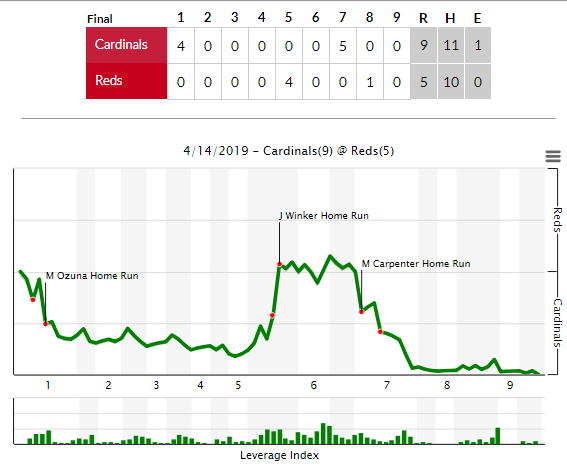 That play increased the Reds chances of winning by 24.9% (from 28.8% to 53.6%). It was the biggest swing of the game despite the Reds not winning today. That does not happen too often. Jesse Winker continues to destroy baseballs. Winker hit his 4th home run of the season, and it was a big 3-run, game tying opposite field blast. He is showing some impressive power early in 2019 with 4 HR through the first 14 games. Winker didn’t hit his 4th HR last year until June 22nd (his 74th game of 2018). Yasiel Puig finally hit his first home run as Red. It was pretty cool to see his first home run with the Reds come in Mexico. Hopefully this is the first of many more to come. Matt Kemp had just his 4th plate appearance of the season against a LHP in a pinch-hit appearance against Andrew Miller. He singled and is now 2-4 vs LHP. It will be interesting to see how he does against a bunch of lefties coming up. That is his strength and where the Reds really need him. Another perfect inning today for Robert Stephenson. He struck out two batters and his season numbers are now: 7.1 IP, 3 H, 1 ER, 1 BB, 10 K. It might be time for Bob Steve to get some high leverage chances. It has been awesome to see him resurrect his career so far in this early season. 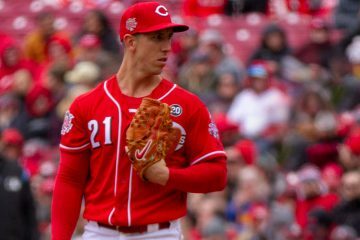 Michael Lorenzen had an RBI single and pitched two scoreless innings. Lorenzen had been struggling a bit on the pitching side of the field, so it was great to see him pitch well today. Anthony DeSclafani got rocked for a second straight start. The last start, you cut him some slack because the Pirates did most of their damage after the “fight” and that understandably could have thrown him off his game. Disco had a 32 pitch first inning where he allowed two no-doubt home runs. He has a 7.43 ERA/6.45 FIP through his first 3 starts of 2019. Amir Garrett and Jared Hughes both gave up homers. It wasn’t a great day for the Reds bullpen. Jared Hughes was charged with 4 runs in an outing for the first time since 7/26/17 for Mil at Wsh. Derek Dietrich had to leave the game after getting hit by a pitch on the leg. It wasn’t just some silly precautionary reason either as the Reds had no one left on the bench and Tyler Mahle had to run. You have to hope he doesn’t have to miss any time because he has been such a huge part of this offense. Zach Duke walked in a run today. Duke has struggled in his first couple weeks with the Reds. I saw a lot folks saying the Reds should “DFA” Duke. He had a 3.01 FIP last year and lefties had a .602 OPS against him. The Reds cutting him after 4.1 innings and throwing away $2 million would be pretty silly. It’s a long season, you just can’t cut guys because of a slow start. Bell should probably use him in some lower leverage situations for a while and see if he can get going. All in all, this was a really nice week for the Redlegs. I think every single one of us would have taken a 4-1 week after the disastrous 1-8 start. The Reds will have a tough week coming up, with 7 games in California against the Dodgers and first place Padres. It doesn’t get easier after that as they’ll come home against the Braves, and then have road series’ against the Cardinals and Mets to close out April. This will be a big stretch for the Reds and actually could end up defining the season. The rest…. meh, at best. Over 162 games, the rest look far from best. No, Duke isn’t likely getting DFA’ed in mid-April..ownership isn’t eating the money. Part of it is the lack of dependable talent in the bullpen besides Iglesias. Part of it is Bell jerking the starter and making more changes most nights in the 5th-7th inning area. I think Garrett is more than a loogy. Using him in that role would be under-utilization. He’s shown good command and control so far in the young season. I agree. In fact my biggest quibble yesterday was that he was used as a loogy. Despite the HR by Carpenter, I would have left him in. He threw more pitches warming up than the reds got out of him in the game. Still great to see Lorenzen pitch well and get a hit before winker’s game tying HR. After that went out, I really thought the reds would go on to win it…. How much revenue did that adventure into Mexico cost the Reds? A weekend series with the Cards and a hot Reds team would have been a gate winner for the franchise. They did not even sell today’s game out. MLB actually comps the team, the players get bonuses for going along with any of the teams to support staff. As for gate receipts, one would assume that MLB worked something out, little chance of a sign off without it. I don’t think the Reds are concerned about attendance revenue. Yeah. They might have had 8000 for each of the games! Theres just something that sounds really dirty about “Big Winker blast”. HK. Bummed they lost. Bullpen looked bad. I just hope this 9snt a theme all season. Anyone know what happened to Dietrich? tomorrow, Ace v. Ace. Castillo v Kershaw. If i had to face Clayton, i would want to do it on his first start after a DL stint where there was a little hit around on his Rehab start, If I had to face him. I agree wholeheartedly about Wood taking Disco’s place. Most other people you would ask say Mahle, but I just couldn’t do that with the way he’s dealing right now. Hopefully Disco is just in a slump and picks it back up his next round. once Wood gets back I would consider moving Mahle to the bullpen. I Think he along with Stephenson would be stabilizing forces in the pen as the season progresses. I missed the Reds tying the game. I just watched Lorenzen’s rbi hit and Winker’s blast. Impressive! Lorenzen had a nice at-bat against a RH All-Star in Mikolas. He also had 2 shutout innings with 1 double play. His first year in the pen he had 50 ip with a 1.08 whip and 10 double plays rolled up. If he could do that then he could start? Go 5 or 6….give up 2.5 and more then occasionally be a part of 1-2 runs of our own! They just can’t bring him in with men on base as a reliever. It takes him a while to get going so they need to give him clean basepaths. Winker with another home run. The only part of the game I saw was Stephenson’s inning pitched. His curve or slider was killer again. I can’t believe so many hitters are still hitting below the Mendoza line. How many LHers will Winker face in LA and SD? Schebler is struggling. It is a small sample size, and that’s reason enough to add pressure slowly, but before this year, he’d have probably walked 5 or 6 guys in those innings, gotten frustrated, and grooved hitable pitches. You don’t think the possibility of losing your job and being DFA is pressure? Perhaps Stephenson is an early indication of the value of the pitching coach hire, and vindication for those of us who thought he should be given a chance with the young pitchers. On the other hand, there is the hitting coach hire and the collective hitting slump, and what it says about those of us who thought he should be given a chance. Can’t win them all! Don’t you think they would’ve inked Scooter already if they were going to? He’ll be 29 in 2 weeks. I’m not in for more then 3 years. I doubt the Reds are either? Dietrich could be Senzel’s backup at 2b. A Dietrich/Peraza platoon if they needed to. Schebler/Lorenzen would be his backup if they gave him CF? If Senzel isn’t atleast as good as Winker then they’re done anyway? They can’t buy players so they have to develop these high draft picks! Heading into today, Tim Anderson was hitting .444 with a 203 wRC+ despite having a a BB% of 2.2, and a K% of 1.7. Charlie Blackmon, Jesus Aguilar, Nolan Arenado, Jose Ramirez had not hit a single home run. Why is that important, if at all? We’re still dealing with extremely SSS and Jose Peraza’s 42 PAs is almost meaningless. I don’t believe a guy that has never had a K% in his career above 13.5%, is suddenly going to start striking out nearly 30% of the. That isn’t “regression.” That is noise. It’s completely fair to wonder if he’ll be more like his 2016 version than his 2017 version. I’m still expecting him to take the next step, but who knows, he might be a guy that needs to play everyday to produce and if that’s the case, he’s in trouble. That said, would it hurt if a Reds player (or team) just crushed March/April one year? It feels like it has been awhile. Scooter and Suarez had pretty good starts last year but May was when they really caught fire. Any follow-up word on Dietrich’s foot come through yet? You could tell he was trying so hard for it not to be a thing… but it was a thing.